Sishupala, the King of Chedi, was an invited guest to King Yudhistira’s Rajasuya sacrifice ceremony. He had accepted Yudhistira as his emperor. But when Yudhistira decided to offer Krishna his first worship as the most revered man present in the audience, Sishupala lost his cool. 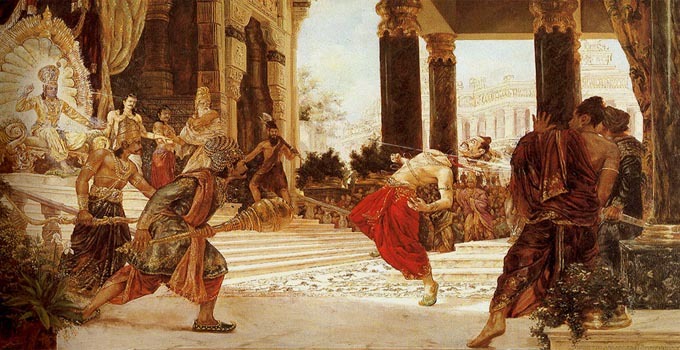 He had an old animosity with Krishna, and he lashed out at him with outrageous insults. Krishna tried to stay calm, but finally he couldn’t take it anymore. He summoned his Sudarshana Chakra and severed Sishupala’s head from his body in front of the assembled Kings and royalties. Listen to this exciting and dramatic episode by clicking the play button below.